We had skipped our December shopping trip and I’m planning to skip February, too. I want to inventory my pantry and freezer and then make a determined effort to use what we have. I really need to defrost my freezer so I’d like to decrease its contents a bit. My plan is to not shop until March, with the exception of milk and some fresh produce. In addition to clearing out some space and saving money, it’s a good way to challenge my creativity and encourage me to try new things. I want to get back to baking all our bread so this is a good way to force me to get back in the habit. My goal between now and my March shopping trip is to not spend more than $10 a week for milk and fresh produce (mostly salad ingredients and bananas – I eat one each morning with my yogurt). 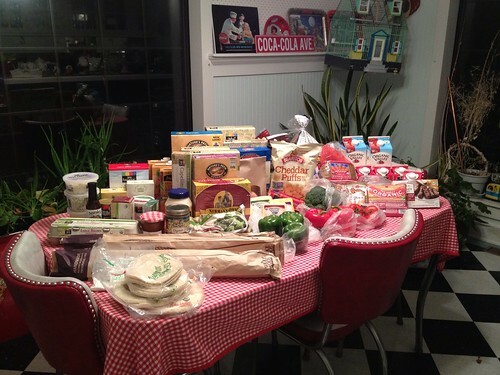 *Lisa’s grocery haul post may be seen here. Wow! You did well, woman!! !